SAUSAGES & SALAMI - "KOLBÁSZ és SZALÁMI"
Otto's carries the finest available Hungarian "Magyar" and European sausages and salamis. There are numerous types of Hungarian sausages available in a variety of forms. Each sausage has their own distinctive taste and style. "Gyulai" smoked sausage, named after the city of Gyula, is specially made for us by our famous manufacturer. All our famous sausages contain the characteristics which originated with the tradition of Hungary and Central Europe. "Gyulai" Hungarian Brand sausage is made with coarsely chopped meat is blended with world renowned Hungarian Paprika. "Csabai" Smoked sausage has the same characters of the "Gyulai" but is slightly spicier. It is Otto's BEST SELLER. "Paraszt" is slightly dry with a garlic flavor. "Csabai" sausage is slightly spicy. "Debrecini" is a small version of the Gyulai and great for BBQ's, breakfasts, lunch or a quick dinner. "Cserkesz", is a thin sausage. Slightly dry and great to munch on. This sausage is called the boy scout sausage because it used to carried by Hungarian Boy Scouts in their back packs. Otto’s sausages and deli items are prepared by our manufactures under very strict USDA inspection, with special attention made to quality control. These high quality products are something our customers have come to rely on. Sausages are Available by the Pair, approximately 1½ Lb. Vaccum packed packages are available in 4 Pair packages. These packages are great for storing the sausages for longer periods of time. [ ] PARASZT - Smoked Garlic $10.95 /lb. [ ] DEBRECINI - Mini Sausages $10.95 /lb. [ ] CSERKESZ - Smoked "Scout Sausage" Thin Sticks $10.95 /lb. [ ] GYPSY- Double Smoked Sausage $10.95 /lb. AUTHENTIC SALAMI IMPORTED FROM HUNGARY! 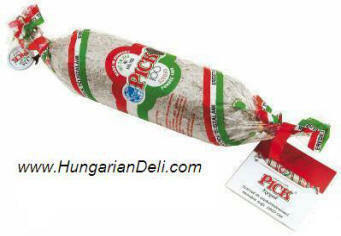 The Magyar Pick manufacturer is the best Hungarian salami makers with the finest traditions. Pick Salami is made in Hungary with the highest USDA standards. "Pick" salami is the only salami available to be imported under these strict guidelines. Many of our customer's have been caught at airport customs trying to smuggle Pick salamis into the country. Sneak no more! Like a fine Cuban cigar, or authentic German beer, there is nothing which compares to a fine legal Hungarian "Pick Salami". Otto's has the best salami Hungary has to offer! Pick is an all time favorite! It is the world's best cured salami! Authentic "Pick" salami is mild and aged to perfection. Similar to Pick Salami - WHITE Skin $ 14.75 / lb. Similar to Pick Salami - BLACK Skin $ 1$.75 / lb. (Also known for its Tulip shape) Spicy. Similar to Pick Paprikas Szalami $ 14.75 / lb. "Téli" and "Csabai." The mild taste of the "Hungarian Brand Téli Salami"is achieved by lightly blending the finest spices with the highest quality meats. If you prefer a light "tang", you'll love our "Téli" Salami. "Csabai Salami" is for the more adventurous. It is blended savory spices and Hungarian Paprika producing a taste that tickles the palate. These products are prepared under USDA inspection, with the special quality control that our customers have come to rely on. Copyright © 1995 - 2018, All rights reserved.